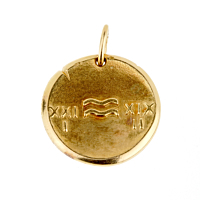 The Aquarius zodiac gold pendant is finely crafted in 18kt yellow gold. The round pendant features the Aquarius signature water jar in relief on the front of this vintage, circa 1970's, charm, and the reverse side features the date of Aquarius in Roman numerals flanking the symbol of the water. Both sides have a brushed finish, with a higher polished soft edge. Pendant Dimensions 1.25" by 1.02"